Our next Oasis meeting is on Saturday 20th April and is themed as our Easter Bonnet Parade. 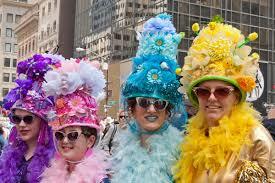 So be outrageous, be fabulous, be different and wear an Easter bonnet to outdo everyone else! Go one better and make it an Easter Outfit. Please be aware that there are some limitations on your bonnets. Vicky, our resident chef to the stars, will be providing the food for this event and the cost of the evening is £8 per person. Of course there is no requirement for you to wear an Easter bonnet. We welcome you regardless. Please can you complete on on-line attendance form below to help Vicky gauge the numbers for the food.